Ernest Nussbaum, the inventor of the Prakticello, brings a little old-fashioned ingenuity to one big instrument. As a young boy in Germany during the 1930s, Ernest Nussbaum grew up hearing chamber music in his home. His mother was a violinist, his father, a professional pianist. They always hoped he’d become a cellist one day to round out the family trio. But in April 1939, about four months before World War II broke out, Nussbaum and his family fled to New York City with little money and few belongings. And Nussbaum had to put his musical aspirations on hold. In 1950, he graduated from Cooper Union in New York with a degree in civil engineering, eventually going on to work for several companies, including General Electric in Bethesda. He was 25 when he finally felt settled enough to take cello lessons. Playing the instrument quickly became his favorite and long-term hobby. He still plays weekly in the string quartet he has belonged to for 24 years! There was only one drawback. “Every cellist, sooner or later, wishes the instrument was a little more transportable, especially if you’re traveling by air.” In the early 1980s, Nussbaum began to think about creating a cello that was compact and portable, but able to produce the instrument’s normal sound. 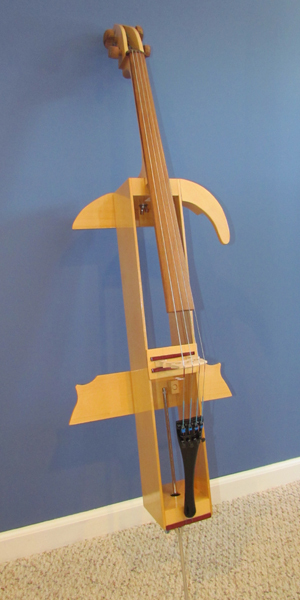 His first creation was the “Travielo,” a portable cello with an amplifier. After realizing that portability was more important than amplified sound, he produced the lighter Prakticello in 1985. He also made travel violins and violas, though demand is less given that they’re already relatively portable. 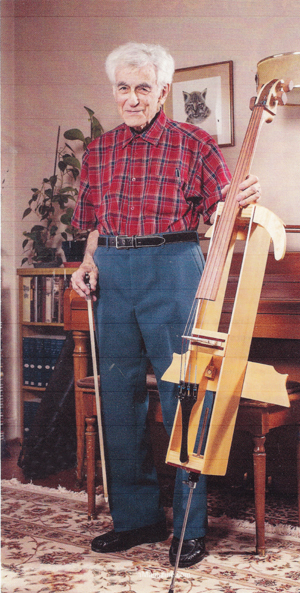 Ernest took a well-deserved retirement from making instruments in late 2013 at the age of 85, after passing his instrument-making knowledge on to Jerry deGroot. Ernest passed away in January of 2017 at the age of 89, we miss him dearly. © 2014 ~ All Rights Reserved ~Web Development & Hosting Provided By Web Design of Palm Beach, Inc.